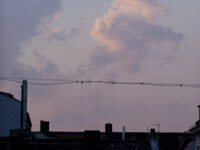 The sky over berlin.. - >> mind the __ GAP* ? .. is still somehow new to me. Its steady presence is accompanied by the various possibilities this city offers. One spot I liked to visit for various events since I came here is the HKW – Haus der Kulturen der Welt – House of World Cultures. The last two days they continued their conference program on Images in the context of visual cultures, which started last autumn. Transmission Image – Images live of transmission. They transmit themselves and are transmitted – in a socio-anthropological and media technological sense. The lively presence of images owes itself to the idea of magic mediation as well as to the palpable media of transmission, that images need for entering into evidence – and starting their migration. Like nomads, images move from place to place, from the imaginary to the medial forth and back, from man to man, from one culture to another. As a result of this high transfer potential, images have been substantially contributing to cultural exchanges. In this function they were highly stimulated by the development of new electronic image transmission techniques. The more transcultural images are circulating, the more intensive are the exchanges and interrelations between different cultures, also those between image cultures. The increasingly image-based transmission of culture, that culminates in the idea of a global visual culture, provokes reflections about the cultural codification of images. What happens if images and visual media enter into a representational system, that is, relating to its image and media culture, differently codified. The conference “Transmission Image” examines the cultural transfer potential of and through images. Following some of the diverse speakers Irit Rogoff’s ‘Field Work – Work of Field’ in Visual Cultures summed up the difficulty to grasp the task without limiting it into a narrow space. Her mentioning of the double positioning simultaniously to be understood as inside/outside to come from critic to critical work showed, that even the naming of it deeply embeds the subject within culture. In this regard to point out the 2001 exhibition of Enwezor Okwui ‘Short Century’, which establised a own african archive to work from, gave a vivid example of experience. Previous Post A link collection.. on blogging ..
Next Post Fragments on visualizing social networks….